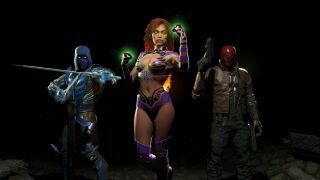 Injustice 2 reveals its first DLC fighters, but who are these other silhouettes? As exciting as these three are, it's the promise of six more fighters that has the fans really curious. You might've noticed at the end of the trailer there that for a brief moment, six more silhouettes appeared behind our main trio. And there are a lot of guesses flying around as to who they represent. I'll go ahead and add my guess that the character just to the left of Sub-Zero is none other than Catman, a sort of underdog (har har) in DC comics. Yeah he's silly, but people love him. My only real gripe/question is: Where's Spawn?? Boon teased the possibility of the Image antihero making a guest appearance late last year, but - unless one of these silhouettes is a fake-out - it doesn't look like he's in. But what about you? Who do you think is hiding in the shadows?